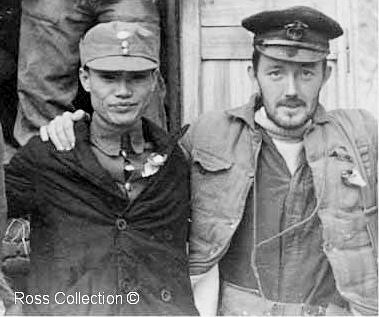 Guirilla leader Leung Wingyuen with Buddy Hide during the escape. Leung Wingyuen had previously served under Admiral Chan Chak patroling the Pearl Delta and surrounding waters. Now he was an independent soldier of fortune regarded by the Communists as a common bandit. The Admiral was able to enlist his aid in conducting his European party into Free China. Chan kept Leung and took as far as Kukong by personally vouching for him with the Nationalists. Leung was decorated with the King's Medal for Courage in the Cause of Freedom in 1947 for escorting the escape party through enemy lines. Leung's son later worked for Admiral Chank's twin sons in Hong Kong. East River guerrilla leader Zeng Sheng's son Zeng Deping book signing with Buddy Hide's son in December 2009. Leung worked for Admiral Chan Chak's twin sons Donal & Duncan in post war Hong Kong during the sixties and seventies designing and installing air conditioning in the rapidly expanding Island city. Leung Wingyuen and his gang knew their back yard very well and although they passed very close to enemy troops, the Japs never noticed anything suspicious. A lot of the Nanao villagers had been in the British merchant service and kept their money in Hong Kong. This accounted for their liking of the British and the hospitality afforded the escapees.